Bring a large pot of water to a boil and cook sweet potatoes and butternut squash until they are tender. While the sweet potatoes and squash are boiling, prepare the casserole topping. Toast pecans in a large, dry saute pan over medium heat for about 5 minutes or until they start to get a deeper color brown. Add the coconut oil, maple syrup and salt and stir to combine. Set aside. Strain the sweet potatoes and squash and then mash them with the coconut milk, maple syrup, butter, and spices. In a lightly greased baking dish, spread the sweet potato and squash mixture evenly. 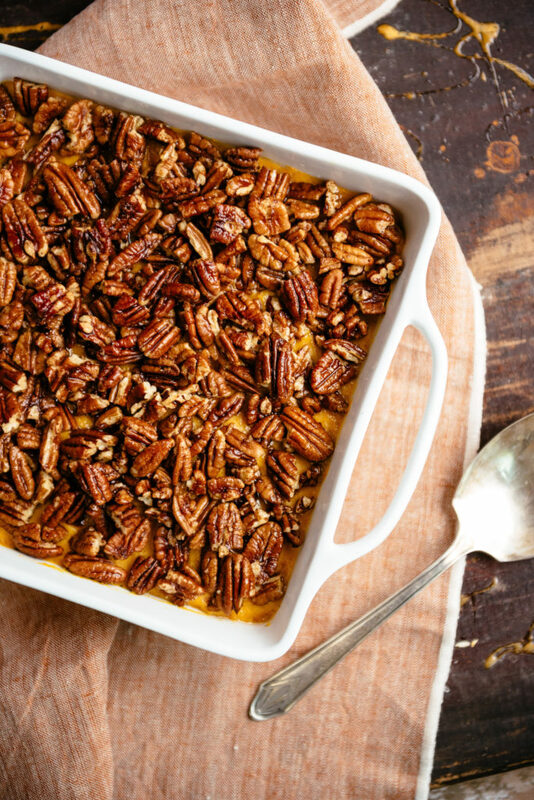 Top with the pecan mixture and bake for 10 minutes or until the casserole is piping hot and the pecan topping is fragrant.